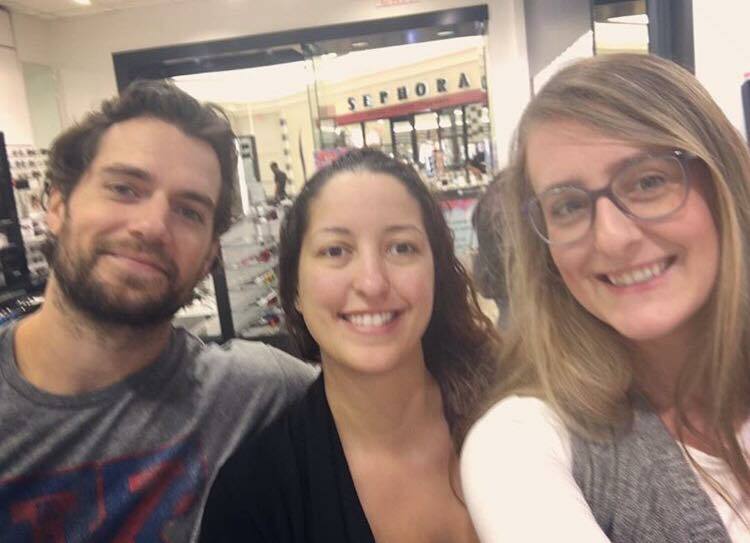 kerrygersten: "Just helped Henry Cavill find a pair of chromance Rayban sunglasses. #superman vs batman love my job!" Kerry met Henry today, and check out the longer hair and beard! South Florida sure lookin' great on him. We can't wait to see those shades on Henry. Has Henry relocation to America??? Or is it a lady that is the reason he spends so much time there. Missing you In London, you coffee is waiting for you!!! Does it really matter?! Both are great reasons for him to move so if he has then good for him. Besides, London is cold and dreary at the moment so who wouldn't want to move to sunnier climate. HC has no serious ties to the UK atm. If he's found someone he thinks is worth relocating to another country for then isn't that a good thing? He's still so young so can travel and love as and how he pleases. The man has always proved to be a 'now' person - living for the moment and seeing where life leads. He's taught me to be just like that anyway. Anonymous 11.11am think you took that out of context, I think they were just observing the fact that he has spent so long there has he moved, there was no need for the snided comment about London. He says he always feels grounded there and it's his home. It was just a casual comment, whyvdo people have to be rude about another's persons questions??? There were no snidey comments. London is cold and dreary this time of year, it's a fact I should know I live here lol! You can still feel grounded and call somewhere your home and yet still move elsewhere, it isn't unusual. Nobody was being rude just not everybody has the same opinions and that's ok. I live in London too and would not describe it as cold or dreary. It's a beautiful and vibrant city any time of year. And if you think 7 degrees (the current temperature as I am typing this) then you should travel more. It's colder in New York right now! And if you think 7 degrees (the current temperature as I am typing this) *is cold* then you should travel more. Anonymous February 4, 2017 at 11:11 AM. When a man is tired of London, he is tired of life: Samuel Johnson. If you're finding London dreary it might be time for you to move. Cold and dreary weather not the atmosphere or people or culture. It has nothing to do with travelling more my dear, my job involves travelling across the globe. I'm from India so I stand by my initial comment. You talk about making assumptions yet you've done just that lol. Again, good day. OMG! He's been in LA and NY for almost a year, I don't see the difference! He mentioned himself that he's everywhere, he has no set place. He also mentioned he is looking to buy property elsewhere. Not to mention moving from CAA to WME, one of the offices is located in Miami. He's been training (jitsu) at Roger Gracies academy in Florida as well, who knows for what, maybe for himself or he might have a hidden project we don't know about yet. He may possibly injured his leg from training/exercise, maybe, not saying it's a for sure thing because he might have attempted to do the splits also and failed hard, who really knows? The guy has been working in London for Justice League months back, Florida is a good relaxing time for him, even if he is living there now or just there for holiday. We won't know for sure until Henry himself mentions it! Let's not get all worked up about his current location and get hyped for his new projects and Durrell (also the London Eye contest). Please? Please get over the fact that it could possibly be a person behind him being there, it could be or it could not, regardless you shouldn't be so worked up to the point you're putting yourself through stress because in the end it's his life and he chooses what to do and be wherever. Like you, you have choice to do whatever in life and nobody to tell you otherwise. Please respect and do the same back. As long as the man is happy and is active on instagram, I am happy for him! Sorry for making this so long. I hope you all are satisfied and have started off this year with a smile! Anonymous February 4, 2017 at 12:38 PM the comments you're referring to weren't made by the same people (I made one but not the other). So who's assuming now!? And if you're from India then everywhere in Europe will feel cold. Can't you all just agree to disagree and leave it there? Any real need to go back and forth over something that isn't really much of anything? Perhaps it's just a misunderstanding, since Anonymous February 4, 2017 at 11:11 AM is from India (and therefore not a native English speaker) perhaps s/he doesn't fully understand what dreary means. Dreary adjective: depressingly dull and bleak or repetitive. Not words to describe London. I don't understand the argument, it went from Henry to weather/country, LOL! Let's keep it within the actual subject. Look at Henry's hair though! I want to see a black suit, I heard he was doing an independent superman film. I think people feel that by calling London 'dreary' it was being insulted. It was only later the commenter decided s/he meant the weather. Either way it's still a unfair way to speak about someone else's country. Honestly who cares ??? Its not that big a deal! We're all guna see each place in our own way whatever the case. Can't go through life finding the littlest thing to be insulted by London won't be crying itself to sleep because someone called it dreary! Depends on how far you've explored London, it can become mundane if you've done everything in London and need a new place to explore. FL does seem more vibrant and a place you don't have to wear a whole lot of clothing outdoors. You're fingers definitely won't freeze when recording or taking a picture outside, as for gloves... let's not mentions gloves, I have a war with them, leather and wool. I tend to avoid gloves. This has to be the most pointless reading today. It was quite clear @11:11AM was talking of the weather, they mentioned climate in the post fgs. London wasn't never insulted if you read it properly. People getting butthurt for no reason. Ikr. Advice: don't post anything if you feel "insulted" or butthurt so easily for nothing. Anonymous February 4, 2017 at 2:04 PM surely if someone feels insulted they have the right to respond (even if some other people wouldn't be insulted by the same thing). If they're feeling insulted then they shouldn't respond at all to prevent drama. That is all. Alas, the world doesn't (and shouldn't) work like that. Free speech and all. Perhaps instead of not responding when feeling insulted, people should think about their comment first and if it will upset someone, particularly if it's off topic. When felt that way they start to respond with their feelings, so not responding would be a wise choice when hurt. There was absolutely nothing wrong or rude with Anon 11:11AM's comment. They are CLEARLY comparing the climate between the two places. Not one aspect of their comment came off as if they were insulting London and/or anything related to it. Also, why should someone have to watch what they say just incase another gets offended? Life doesn't work like that there's always going to be someone who gets upset no matter the reason. To be offended by something is a choice. What are you talking about? I'm so confused right now! This whole thing just went wonkey. I didn't feel there was anything offensive with the response, only the person who took the response in an insulting tone. The person who felt insulted should have just ignored the response or waited to respond when they understood the whole sentence itself because feelings help jump to conclusions which is not a good thing as they misread things or just read between the lines. Let's just agree that we don't want to talk about it anymore, otherwise, it will create even more confusion and slide completely off topic as it has already lol. *face palm* I need glasses. Right idaho cold and slippery..
Where we love is home - home that our feet may leave, but not our hearts. Oliver Wendell Holmes, Sr.
Loving the longer hair and beard. Maybe for a role? Long live the curls! + beard. Omg! Don't you hate it when you comment somewhere but it ends up on another post? I can understand people caring though, when they feel their capital city (and by extension their country) has been insulted. I would like to know what happened when he was wearing it to make it his lucky hat? I mean, if you see who's said what, it shows they're both in UK. Why would either be offended by somewhat of a factual opinion, that's what I don't understand. I do understand that they are very fond and caring of their country/city, but overall it's an unecessary argument and shouldn't be because there's really nothing to take offense by. I love both UK and America, so I'm not saying anything another will take out of context. I love my country and it is cold, I do hate the weather but I have nothing against my country or my city, I love my people/people in my neighborhood and I love being a HC fan. People have disagreements, but never should turn it into an argument and be more accepting to each others opinions. They don't necessarily have to agree. Hope that makes sense. Anonymous February 4, 2017 at 1:27 PM, how is calling London dreary 'a factual opinion'? It was only later s/he said she meant the weather but even so how is that 'a factual opinion' either? Surely describing anything or anyone as 'dreary' is just an opinion. That opinion would be based on a persons past experiences, likes and dislikes etc. It is an opinion but NEVER a fact. What is a factual opinion? Surely that's a oxymoron. This thread was about Henry's hat!! Hello 1:36 PM, I said "somewhat of a factual opinion", I read cold. It is cold in England at this time of month. It's the same person reposting different times. Ignore it. Anonymous 1:36, 1:38 and 1:41 are the same person. Just so you know @1:42. The repetition of the same answer gave it away. Oh I couldn't really care if they're posting so much, a lot do it. They misunderstood what I was saying so I answered back. People misunderstand, we're only human. It's all good. It's not the same person. I was the one who asked what a factual opinion was. A genuine question, is it a thing? But I didn't post the other stuff. Yes, it's a thing. I learnt it back when I was much younger in school, I didn't understand it at first, but later on in life it became quite common. Like forming a judgement based on own/general fact. Do I have this right. Factual opinion = A fact based opinion e.g. My opinion is that the world is round not flat. But not, for example that London is cold because that would depend on what I consider is cold (below zero for me) but if I was use to a warmer climate I would find London's current climate cold. I hope that makes sense. London is known to be cold, so it's a general fact really because of rain and wind. Everyone who visit/live in London almost always mention rain/cold. London is the attraction when it comes to visiting England. The person who first mentioned London being cold (at this time) makes it factual because it is cold, I've just from the outside (in London). One thing I don't get, how would he bang his head when he hurt his leg? Unless he does some type of yoga we are not aware of? This goes to the theorist. Describing anywhere as cold depends on where you are comparing it to. I moved from Sheffield (in the north of England) to London last year and London it a lot warmer. However, London is cold right now compared to Florida. It's all relative not factual. As I've said before London is known to be cold in general aka fact, especially this time of month. The person was comparing it to Florida, if you've read it correctly. Ultimately, it's a their factual opinion. Chill, Anonymous February 5, 2017 at 4:33 AM, they said "London is cold right now compared to Florida". London is warm compared to some other cities and cold to others right now. I know what you said. I said they were comparing it to Florida makes it factual as it is cold right now. What other country did they compare to? I'm a little confused, did I miss something? All I was saying is that it's an unnecessary argument as someone was stating something and another randomly took offense to it for no valid reason really. I honestly don't know what you want me to "chill" from. Do you want me to stop answering? Well I apologise beforehand if you feel I've said something you didn't like or if any of my wording seemed harsh. Why do you think Anonymous February 5, 2017 at 7:28 AM is Anonymous February 4, 2017 at 11:27 PM? They said 'they' not 'I' in the comment. Weird. Are people getting paranoid? Everyone is posting more than once in different form so it's not easy to tell who is who apart. So technically everyone is Anon, especially the ones posting the same way. More like a big sigh..
At least it's better and more polite than some other dialogues. Very true! and thank everyone for that. Just a bunch of misunderstandings and misinterpretations, and people taking it out of proportion. Hopefully it dies down soon. South Florida seems wonderful. I'm planning on going Hawaii with my sister before we grow distant. It all kicked off because someone from India called London dreary. I've learnt not to slag off London to a bunch of Brits. Handbags at dawn! Only a select few Brits, we all wouldn't take it this far and take offence to someone commenting on the weather. Just seems like people love finding any little thing to complain about. A sign of modern times perhaps. Hahaha it's common place for people (in & out of uk) to talk about our weather. Moaning about the weather is our "thing" remember; lets not act as if we don't do it ourselves. Let's all form an orderly queue and chat about the weather. OMG cannot believe this page erupted over one little comment I made. �������� Too much time on your hands, guys. I suppose you can include yourself in that statement too. Nah I made one comment then went on with my day. Everyone else continued. But yet your back now and posted twice. I can't help but think that people who live in glass houses and all that. Anonymous February 5, 2017 at 12:40 PM Did you seriously come back 2 days later and read through the 80 plus comments and then comment that we have 'too much time on our hands'! Hahahahaha. That person didn't make one comment judging from their response LOL. No need to be ashamed.